Last year's project by Artist Allan Ryan - stay tuned for updates of this year's mural! We're back and about to look more beautiful than ever! After last summer's success in crowdsourcing some beautiful public art, the team from the HAT is at it again! This year, we've set our sights on Bentinck St. and have commissioned a gorgeous new mural from our own resident technical director, Kayla Cormier! Work on the new mural has begun and we are planning to incorporate 10 new characters from 10 productions in this first phase of the new public work. The new mural "broke paint" today on the corner of Bentinck and Prince along the side of the former St. Andrew's Hall. 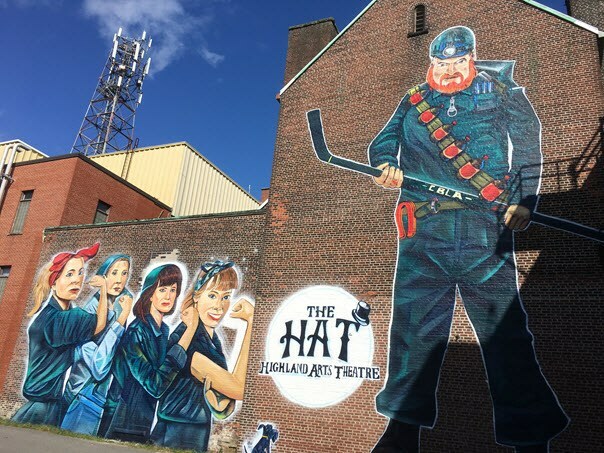 As work continues, you'll recognize some of your favourite characters from HAT productions, as well as some classic literary figures that have graced our stage. The sky truly is the limit for what we can achieve! But we need your help. Last year, the people and businesses of Cape Breton came to the plate and this year we're hoping you'll do the same. We're announcing the second edition of 100 Squared, our attempt to get 100 people or businesses to donate $100 to help with the cost of this project. Murals aren't cheap, and the equipment, supplies, and permits cost literally thousands of dollars. If you are a business or an individual who wants to help the HAT grow and downtown Sydney revitalize, please consider donating. For $100, we will include your name on a plaque that will be placed at the base of the mural for the duration of its life. If you want to be a part of 100 Squared, or you'd just like to donate the cost of your daily coffee to the cause, please contact us at (902) 565-3637, visit our office at 40 Bentinck St, or email us at engage@highlandartstheatre.com. HELP US SPRUCE UP BENTINCK!